Over the past few weeks, I have increasingly found myself drawn to the Hundred-Acre Wood. I have been reading A.A. Milne’s original stories, as well as listening to them on audiobook performed by Peter Dennis. For those of you who have ever read or studied the original works, you’ll know that this is not the red-shirted, stuffed with fluff, version of Pooh Bear and his friends. A.A. Milne’s stories did one thing that I thoroughly enjoyed; they did not talk down to their audience. This is something that, up and until recently, various types of media being released from Disney did remarkably well. It is at this point that I should mention I am part of the book club, Disney’s Wonderful World of Reading. Recently, I received in the mail a copy of one of the many Winnie the Pooh stories. On the cover was Pooh Bear and Piglet being rushed away by an overzealous gust of wind. At one time, the only Winnie the Pooh I knew of was on a short VHS entitled Winnie the Pooh and the Blustery Day. So, as a way to harkening back to my younger years, as if I don’t do enough of that, I read through the book once before placing it on the shelf with the multitude of other books. 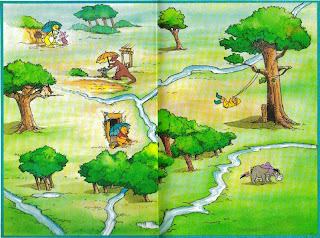 Earlier this week, after finishing A.A. Milne’s accounts of Pooh, I went in search of the Wonderful World of Reading book, in order to scan a copy of the Hundred Acre Wood map present on the inside of every cover of every Winnie the Pooh book I’ve ever seen. It was only after I picked up the book for the second time that I realized that the title had been changed. The book in my hand was not the same story I had grown up with, it had been retitled: Winnie the Pooh and the Windy Day. This may seem innocuous and not something to raise a fuss over, but I was actually incensed. Of all of the issues that face children today, of all the challenges that teachers must face, I have always found the issue of literacy to be the most complex, far-reaching, and easily-fixed problem that we face. Reading to and with children are experiences that every child should have daily. It promotes social interactions, leads to basic writing skills, creates sound recognition, and increases vocabulary. What I found in this 2000 edition of the classic Winnie the Pooh story was, in my approximation, an attempt to dumb down a perfectly fine story. It is okay if children do not recognize a word immediately. They can sound the word out, ask a parent/teacher/adult for help and a definition of a word, and they can use context clues from the words surrounding the word to find meaning. A lot of fantastic things have come from, and will continue to be found in, Disney’s Wonderful World of Reading. As for the stories of Winnie the Pooh, perhaps when those stories are pined after by my preschool students and, later, my own children, I will stick to the originals by A.A. Milne that promote literacy not the easy way out. I didn't know someone could change a title without the authors approval. It will ALWAYS be Winnie the Pooh and the Blustery Day!!! To be fair, Winnie the Pooh and the Blustery Day was the title Disney attached to their adaptation to five chapters of A.A. Milne's Winnie the Pooh and House at Pooh Corner.